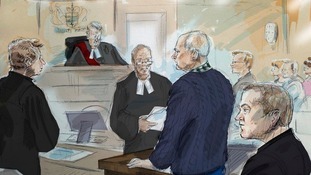 A former landscaper has pleaded guilty to the murder of eight men he met in Toronto's Gay Village over a period of seven years. Bruce McArthur, wearing a black sweater, stood up and said "guilty" to eight times as the charges were read in a courtroom. His sentencing will begin on February 4. The 67-year-old was arrested in January 2018 after years of speculation that the missing persons cases were connected to Toronto’s Gay Village neighbourhood. He was initially charged with the deaths of two men before the police subsequently charged him with six other murder counts. Police last year found the remains of seven of the men in large planters at a property where McArthur had worked. The prosecutor, Michael Cantlon, said the cases ranging from 2010 to 2017 involved sexual assault or forcible confinement and said the bodies were hidden and dismembered. McArthur moved to the Toronto area almost 19 years ago and previously lived in a suburb where he was married, raised two children and worked as a travelling salesman of underwear and socks. Police set up a special task force to look into the disappearances of men in the Gay Village area of Toronto shortly after some went missing. The alleged victims fit a pattern - most were of Middle Eastern or South Asian descent and lived on the margins of Canadian society. One victim hid the fact that he was gay from his Muslim family and another was a recent immigrant with a drug problem. But then Andrew Kinsman vanished - a 49-year-old LGBQT activist and former bartender in Toronto who had many friends. When he suddenly went missing, the day after Toronto’s gay pride parade, in June 2017, his friends noticed quickly, and so did the police. The Toronto Police’s handling of the case prompted backlash from Toronto’s LGBTQ community, many of whom believe the authorities did not take their concerns about the missing persons seriously. In Canada, each count of a first-degree murder charge brings an automatic life prison sentence. McArthur won’t be able to apply for release until he is 91-years-old.